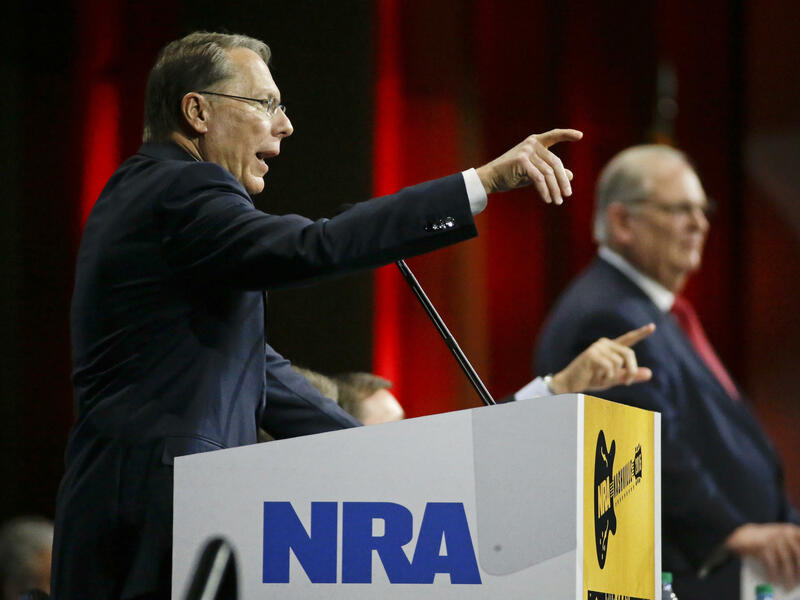 Wayne LaPierre, left, executive vice president of the National Rifle Association, speaks at the NRA convention in 2015. A Russian politician who claims to know President Trump through the group says he saw him at that convention. The gun control group Everytown For Gun Safety will display billboards with images like the one above during the National Rifle Association annual meeting in Dallas this week to press questions about the group's ties to Russia. It's a literal sign about how questions regarding the NRA's associations with Kremlin-linked Russian politician Alexander Torshin have risen from a whisper to a dull roar over the past two years. Everytown for Gun Safety, a gun control group that opposes the NRA, has made it a point to press the matter. The group told NPR that it will be blanketing the homepage of the Dallas Morning News with ads on the links between NRA and Russia starting on Thursday, to coincide with the start of the convention. It will continue on Friday, when President Trump and Vice President Pence are slated to appear. Throughout the four days of convention, four mobile truck billboards will circle the convention center, as well as the site of the NRA's prayer breakfast and the site of the NRA's country music event. In Russian and English, they'll ask NRA convention attendees: "How much money have you taken from Russia?" and "Why have you cozied up to Vladimir Putin's Kremlin?" The NRA has been coming under increased pressure for the past several months: McClatchy reported earlier this year that the FBI is investigating whether the Kremlin illegally funneled money to the NRA to help the Trump campaign in 2016. And CNN reported last week that the NRA is setting aside documents that relate to Torshin as preparation for a possible investigation. Torshin was personally targeted last month by U.S. sanctions, which name him as among a group of Russian nationals "who benefit from the Putin regime and play a key role in advancing Russia's malign activities." "The drumbeat of alarming news about the NRA and Russia is only getting louder as the NRA prepares for its annual convention. It's time for the NRA to come clean — on Russian money and its ties to Russia — and this year's NRA convention is the perfect time to do it," Everytown spokesman Andrew Zucker said. A spokesman for the NRA did not respond to a request for comment, but the organization has asserted in the past that they have engaged in no wrongdoing, and did not receive any money from foreigners for political purposes. The annual NRA convention has been a key location for many of Torshin's efforts to cultivate relationships with senior NRA officials. As NPR has reported, Torshin attended every NRA convention from 2012 to 2016 to build his network in the gun-rights group. Over the course of that time, he has met with every person who has been president of the NRA since 2012. Torshin, who claimed to know Trump through the NRA, also claimed to have seen Trump at the NRA convention in Nashville in 2015. Photos taken of Torshin throughout the years indicate that he developed a particularly close relationship with former NRA president David Keene. But the most notable chain of events occurred in 2016, during Trump's presidential campaign. According to a report written by Democrats on the House Permanent Select Committee on Intelligence, Torshin used a Republican strategist named Paul Erickson as an intermediary to set up a meeting with Trump himself. "Happenstance and the (sometimes) international reach of the NRA placed me in a position a couple of years ago to slowly begin cultivating a back-channel to President Putin's Kremlin," Erickson wrote to Rick Dearborn, a senior campaign official and a longtime advisor to Attorney General Jeff Sessions. The proposed meeting between Torshin and Trump would supposedly "take place just prior to then-candidate Trump's speech" to the NRA convention, the report reads. But the meeting with Trump himself never happened. Jared Kushner instructed Trump campaign officials to pass on the meeting, according to the House intelligence committee's Republicans. "A lot of people come claiming to carry messages. Very few we are able to verify. For now I think we decline such meetings," Kushner wrote in an email. However, Donald Trump, Jr., and Torshin ultimately met during the NRA convention in 2016. The Republicans on the House intelligence committee found no evidence that they discussed the election. Democrats on the committee point out that this conclusion relies only on the "self-interested testimony" of Trump Jr., and note that Republicans on the committee refused to interview Torshin or Erickson as part of their investigation.